Many elderly people are targets for fraud, especially those who live on their own. But over the past few years, elderly residents of nursing homes have become targets, with more and more incidents of their money being stolen by the bookkeepers and office managers who handle their trust funds and expenses. Many residents request that long-term care providers handle their trust funds. The trust is expected to act as a conventional bank account. It should accrue interest, provide monthly statements, and have trustworthy oversight. However, there are cases all over the country where nursing homes have been penalized by regulators for mishandling funds. There are hundreds of instances where administrators and employees of nursing homes steal large sums of money from trust accounts for shopping, gambling, and daily expenses. In other cases, the homes cannot account for their holdings, do not carry insurance to protect the money in the trust, and even fail to pay out interest on the trust fund money. Over the past several years, federal investigators have issued out over 1,500 citations to nursing homes across the country for failing to protect trust funds from theft, according to data from the Centers for Medicare and Medicaid Services, which is the federal agency that regulates nursing homes. And many of these thefts from trust funds at nursing homes across the country involve sums of over ten thousand dollars. Federal laws do not require long-term care facilities to audit their resident trust fund accounts. While federal law does require nursing homes that participate in Medicare and Medicaid to maintain trust fund accounts, the rules do not require any sort of regular audits. 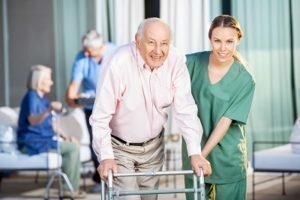 Although some nursing homes perform audits as a matter of company policy, many funds in nursing homes are not subject to any independent accounting. This type of lax oversight often allows trust fund thefts to occur over a long period of time without detection. If you are concerned that your elderly loved one may be a target of trust fund theft in a nursing home, a Fairfield Ct elder law lawyer offers steps you can take to help prevent this crime. First, review all quarterly statements with your loved one and watch for any charges which seem out of place. Second, ask the nursing home if it performs audits on resident trust funds and find out how the funds are managed. Third, look at the nursing home’s record. A good place to start is with the link provided above. Fourth, make sure that the fund is being held in an interest-bearing account and make sure that the interest is being paid. And finally, if you have any questions or concerns about the safety of a trust in the hands of a nursing home, contact Sweeney Legal. Each elder law lawyer Fairfield County CT families recommend from our firm has years of experience in estate planning and elder law and can help investigate any claims you may have.